In the past five months my two oldest children, my girls, have both moved out. Julie, our oldest, graduated in May and had a job offer in Phoenix beginning in August. She and I made the four day cross country trip together. Those days were filled with a sense of adventure and wonder, but they were also heavy with awareness of our ultimate mission. For me, that was leaving my girl behind in a brand new city 2,000 miles away and coming home without her. For her, I think it was some of that, but also being the new girl at a new job in a new town and all of the unknown that comes with such a brave quest. Honestly, I can't even imagine making a move like that. I live in awe of these incredible people that are my children. Our baby girl, Amy, just officially moved last week, but we signed the lease on her new place in December. She's been staying in Richmond some and was traveling for a while. Budapest. Yeah, I know. So it feels like she's been gone longer than she has. Amy worked so hard to be accepted to VCU - it was her only pick. She's living with her homie, Jackson, in a beautiful old row house downtown, the address of which is only 113 miles away. The proximity makes me happy, but her leaving still stings a little. For the few months between Julie's graduation and departure, when both girls were living here, some weird stuff went on. They moved their two queen sized beds into one bedroom. They called this masterpiece/monstrosity - "MEGABED". They made the other bedroom into a 'lounge' - complete with a crazy 60's sofa and a Budweiser lamp. Both rooms were out of control. Dirty was only the start. My girls' big brains are far too consumed with great ideas and wanderlust to be overly concerned (read: not concerned at all) with the keeping and caring of their rooms. I'll just leave it at that. As hard as it was to see them go, I was ELATED to begin the recovery mission on their rooms. Today I'm going to give you a tour of Amy's old room, which I'm calling Room 2A because she's our second born. I want to say up front that I spent under $300 on everything, yet the space is completely transformed. I was going for a vintage boho vibe and I've got to have that dash of pink sprinkled on top of, well, everything. Step #1 was totally cleaning the room, getting the closets right and touching up the paint. We had recently painted and I love the color, so that step was simple. Here's the view from the door. I've written about the floors in the past. We built them from giant sheets of heavy cabinet grade plywood. I love them and I wish they were everywhere in my house but they are only in this room which adds to the overall swagger of this space. When I was 20 years old and looking through house plan books, I had no idea what a useless waste of space a dormer window is. Fast forward to present day, we have them and they're a decorating challenge. I already had this cool rattan shelf that I thrifted a while back. I moved it into the dormer and loaded it with cool stuff. What makes any space special is the personal details. This shelf holds my beautiful pink Royal typewriter, a postcard my daughter sent home from the bottom of the Grand Canyon, and of course, the amazing Bohemery Co. macrame hangs next to it all. And plants. Plants rule. Especially in this room. Turning from the shelf, we catch a glimpse of the funny little light that I saved from the back room of a local lighting store after searching and never finding 'just the right thing'. I paid $35 bucks for it. It was originally marked $185. Yes, sold. Totally diggin' this little shelf. I bought it a long time ago and wasn't able to use it where I intended to. Thankfully, I save everything (cool) and had it to hang over the bed in this makeover. Let's review the wall with the chair. Blue flea market chair, thrift store paint-by-numbers, a plant with pink-edged leaves, and twinkle lights. Done. I have to check myself because I had lots of ideas for this wall, but the room isn't huge and more could have quickly become more. No need for that. Get it to where it makes you smile and walk away. This dresser/desk/shelf was the 2017 Craigslist Score of the Year for me. It makes me so happy. Happy enough that I'm posting this photo even thought the lamp shade is CRAZY crooked. I love it that much. Another quirky detail that's just for fun is this book. Julie, eldest kook, LOVES 'Tom Sawyer' by Rush. We don't really get it but we totally support it and this book is a nod to her band. Rock on, Juju. Anyone that's ever worked with me knows I always push for all white linens. It looks clean and when it's not, you can bleach it and bleach is my friend. I've kept it from being too boring by mixing fabrics and patterns and adding a few fun throw pillows for color. The ball fringe on the duvet is my favorite. This room is so magical at night with all of the twinkle lights on, but it doesn't photograph well. When I'm the photog, it doesn't photograph so great during the day either but, hey, we can't all be good at everything, now can we?!?! That's all for now. I'm still working on the other room, still unnamed. It's pretty amazing so far. Lots of pink. I hope you are working on something that brings you joy. If you need ME to work on something that brings you joy, hit me up. I'm always ready for fun. It's 2018! Get after it, my homies! I have had school-aged children for 19 years if you count pre-school. To me, the beginning of the school year feels like I imagine New Year's Day feels to other people. January 1st is my birthday, so I NEVER start on any new commitment or project that day. As the first day of school approaches, I begin to make a mental list of the fall projects I want to get done. High on that list is usually giving my closet some attention. When we are in summer mode, things can get a little out of control. I get busy doing fun stuff and the closest gets neglected. I’m not one of those people who packs up seasons and changes them out. I have what I have and it’s there for me to see and keep organized all year long. When our house was built, stained trim was the thing. Over the years, I have been converting everything to white. It’s an extremely daunting task, so the closets have been some of the last places to get ‘the treatment’. This is the treatment: a light sand, two coats of Zinsser primer, and two coats of Sherwin Williams Pro Classic. The job is no joke, but the result is a bright, crisp transformation that you wouldn’t expect from such a simple change. A while back I finally did my master closet. Here are a few shots from that project. Here are some simple steps to having and keeping an organized closet. Number one for me is having identical hangers. It’s so worth the small investment to have decent hangers. The heavier ones are for jeans. Tons of hangers in every color of the rainbow hanging every which way is visual chaos. I know people who live with closets like these. They call me ‘Mom’. I hang like things together. Short sleeve, long sleeve, dresses, jeans. And l arrange my clothes by color. I do this because I’m a little nuts that way. But my closet is very soothing, so… The jeans should all hang facing the same direction - pockets to the back. Otherwise, they hang wonky. This will kill your entire closet vibe, and we can’t have that. There’s some statistic about us only wearing like 20% of what's in our closets. Or is it that we only use 20% of our brains? I can’t remember because there are certain items I refuse to get rid of and certain statistics I refuse to take up that 20% of my brain with. At any rate, SURELY there are many things that would have better lives somewhere other than in our closets. We’ve all seen the organizing shows where they ask the questions… “How does this make you feel?” “Does it fit?” “When did you last wear it?” That kind of stuff. You can do that, and it works as long as you’re honest. The cheater's way is to turn your hangers around. Once you’ve worn something, hang it back up the correct way. After six months or so, anything left hanging the wrong way has to go. The simple truth is that I only have space for a certain amount of stuff. If things are getting cramped, before adding something new, I have to get rid of something old to make space. I don’t know what to say about shoes other than I LOVE THEM! I have too may. I know this. I’m okay with it. I keep them put away with one facing forward and the other facing backward. This creates a lot more space so that I can keep them all without too much judgment from my closet mate. My secret for boots is placing cut up pool noodles inside to keep them standing tall. Sweaters have always been a challenge for me. If you stack them too tall, the pile starts to topple over. If you spread them out, they take up too much space. So I invested in sweater keepers from The Container Store. They work great and they look pretty. The result is a space that feels good to walk in to and one less project on your to-do list. If your closet needs more attention than you can handle, I’m for hire. If you’re cleaning out and have donations, PLEASE check with my friends at 99 for the 1 to see what they need. They are amazing and are working hard to help make life better for some special folks in our communities! Until next time, keep it tidy my homies. This is my first blog post in a really long time. I have been too busy living life to write much about it. Since my last post we have had a wedding, a funeral, a college graduation, and I had my own little dream come to life in The Coral Caravan Vintage, Farm & Flea Market. There have been many tears shed over these past months. Tears of pure joy, total frustration, heartbreak, and pride. However, there have been way more smiles and belly laughs than tears. I hear people comment and I see posts often about how we only share the shiny moments of our lives on social media. While there are surely those people who use this platform to create and share a cyber life that is in no way akin to their reality, I believe that most of us are living like me. We are living lives that are full of the bitter-sweet moments that connect us to each other. Whether there’s something huge going on or we are just living through an ordinary Monday, we are all experiencing bliss, hurt, joy, and disappointment daily. In April, our Lilly, who grew up across the street from us, my daughter-like eldest child, born of my best friend who has moved on to Heaven, was married. It was a beautiful and WAY fun affair, every detail perfect - with the exception of our missing Renee. A ton of time, preparation, and love went into planning the day and it was absolutely worth it. Seeing this adorable couple surrounded by all who love them was truly a blessing. Here's a shot of the day courtesy of Skylar Wyatt Photography. May brought a day that seemed a lifetime away when my tummy was giant with a baby girl about to enter the world 22 years ago. Our oldest daughter, Julie, graduated from JMU. The weekend was full of friends, family, and shenanigans. While it was among the proudest moments of my life, it was a really sad thing to watch my little girl say goodbye to a life and a town and people who had all become home to her. College was her cocoon and she has emerged changed and ready to fly away. We have loved having her here with us for this small stretch of time as she prepares for the next big chapter in her life. Amazing things are happening for this brilliant and precious scientist. June 10th was the big day for our market. I spent months planning and preparing for The Coral Caravan and it was everything I dreamed it would be and then some. At then end of the day, I was so exhausted and sweaty and overcome with euphoria that I could barely remember some of the details of the event. Luckily, once again, I had my ace photographer, Skylar Wyatt Photography, on the case. Here’s a little of what she captured. A couple of weeks ago my stepmom passed at only 64 years old. She was a huge part of my growing up years and her death brought a flood of emotion. It was her wish to be buried in the river where we spent many summer days as a family. It’s where we buried my dad when he left us ten years ago. She is the fourth person of great importance I have lost in as many years. That weight seems heavy sometimes, but I remind myself that to have loved these amazing humans was a gift I would pay any price for. Even the great price of bearing the pain of their loss. I was waiting until I had time to write something really meaningful for my few faithful followers, when I realized that often the ordinary is most meaningful. Even though I’ve shared some of our bigger moments here, there have been many ordinary days mixed in. Beach days, sick days, fights-with-my-hubs days, adventure days, sad-for-my-friend days, waiting-for-a-new-baby-to-arrive days, planning-for-the-future days, project days, and laying-on-the-sofa days. So as I set off today on a big adventure that I WILL be posting about, I celebrate us, the imperfect parents and partners, the takers of terrible selfies, the seers through the BS, the tellers of the harsh truth. Cheers to real life and real people. Our days are rarely picture perfect but that doesn’t mean they’re not worth capturing. We have three children. They are among the top four on the list of 'Most Amazing Humans I Know.’ The order of this list varies by moment. This photo is of the three of them standing on the cliffs at Big Sur two Christmases ago. The oldest two, my daughters, are both in college and on spring break this week. Of all that I've passed on to these girls, their wanderlust is one of the things that I'm most proud of. For Julie, our oldest, this is the last spring break of her undergrad years. She is a senior and will be graduating in May. She has chosen to spend the break with other kids from her school making the world a better place on what they call 'Alternative Spring Break.’ She will spend this week living and working in Joshua Tree National Park as a volunteer. The group raised money to ensure that each student had what they needed to cover the costs involved. They will live outside, in what I can only imagine are harsh conditions. I was unclear before they left exactly what the work would entail. It sounded like they would be clearing overgrown trails and such. We have had very limited communication with her as there is no place to charge cell phones and the service is dicey. We know that she's there, she's safe and she is apparently experiencing some type of hippie nirvana. Here is the one photo she's been able to send us. Unfiltered and perfectly breathtaking. Our younger daughter, Amy, is on her very first spring break. She and her friend Jackson have traveled to Iceland. The stuff of dreams, right? They left with high hopes of witnessing the Northern Lights. They planned to go cave diving in water heated by an underground volcano. In this particular pool you can swim to the bottom and touch the tectonic plates of two continents at the same time. This sounds like the type of vacation that people wait their whole lives to experience. Or even worse, dream of doing but never have the opportunity. Amy saved her money and planned a very financially savvy trip in order to make this work. She only has wifi when they find a hostel to stay in. She sent me this photo beacause she said it made her think of me. Here a few more that look like they came from a calendar you buy in the airport in Iceland. You see, we live as best we are able, by the code of 'have less, do more.’ There are a great many things I'd change about our house if there was a money tree out back. For example, we are living with vinyl floors and Formica countertops, both of which are in "perfect condition and will serve us for years to come" according to the hubs. He may be the most 'if it ain't broke, don't fix it' dude ever! And while money isn't endlessly abundant, we are super grateful for what we have and what we are able to do. We do well with the maintenance around here. The lawn is healthy, the windows are new and the A/C will freeze us out in the summer. So what if the flooring is a little mis-matched and the master bath needs to be completely remodeled? We would rather use those dollars to fund an adventure for our crew. We have been known to spend our Christmas budget on socks and a tropical vacation. That kind of time with these offspring of ours is so limited. The memories we make are the currency of this family. Whether we are road tripping up to the near-by Blue Ridge Mountains or down the Pacific Coast Highway, funny things are being said, arguments are happening, the best taco’s in the world are being consumed and we are all together to experience it as one. I can see the future coming at me all too fast. These brilliant babies are going to grow into self-reliant adults who will fund their parts of our family adventures - and our house will have marble counter tops and a claw foot bathtub… Or maybe not. Maybe we'll sell it all and live in an Airstream and travel North America like gypsies, who knows? Until then, we will live simply and travel often. Life is short and the world is waiting. Put off that big project for now. Book the flight. Buy the tiny camper. Pitch a tent in the backyard. There’s no place like home, but that's only one aspect of happiness. The very best place to be is together. I've never been able to put a label on my personal home style. I like to surround myself and my family with the things that make us feel happy and loved. It wasn't until my oldest child came home from college for a visit that I began to understand what our exact style is. She walked in and said, "man, I love it here. It feels so good." Things that day were as they often are here. There was good music playing, fresh flowers in a vase by the kitchen sink, candles burning all around the house and something yummy simmering on the stove. That's our style. Cozy. The word 'cozy' has always been an important part of our family's vernacular. When someone here is feeling bad or has had a hard day the cure is usually hot tea, a warm bath, and time spent under a heavy blanket. Whether it's cold and rainy, we are having a movie night, or just spending solitary time reading a good book, we get cozy. Blankets, socks, candles, soup, tea - these are staples. Even when I travel, I bring along my favorite things to make a strange place feel more like home. A couple of days ago, I was on the amazing Interwebs and I came across a hashtag (or as my hubs says, a pound sign) that was brand new to me. It was #hygge. I searched the new-to-me hashtag and to my amazement, I learned there is a Danish term that describes my style perfectly. Hygge. Hygge, pronounced HOOGA, can be used as a noun, an adjective, or a verb. This fantastic word was even shortlisted for The Oxford English Dictionary's word of the year for 2016. It's more a feeling than a term. Here's a definition that I really love. HYGGE (hoo ga) 1. The art of building sanctuary and community, of inviting closeness and paying attention to what makes us feel open-hearted and alive. ; 2. to create well-being, connection and warmth; 3. a feeling of belonging to the moment and to each other; 4. celebrating the everyday. There's lots of fun reading on then topic as there is apparently much buzz surrounding this movement. I'll give you my version of the essentials in a nutshell right here. *Lighting - Burn candles, build a fire, keep the lights low and well placed to lend warmth to your home. I personally love to use twinkle lights around my house to add a casual low-key level of cozy to our space. *Warm drinks - Brew some coffee, tea, hot chocolate or a hot toddy. If you're into those dark heavy beers, go for that. *Unplug - Put away the electronics and connect with your surroundings and the people you love. *Pile on the warm layers. Bundle up in your sweater, wool socks and scarf then wrap up in big, heavy old quilt. *Lovin' from the oven - The act of baking is in and of itself quite comforting to many people. I am one of those. I love to bake. The structure of a recipe, the waiting while it bakes, the having created something yummy for my tribe all bring me much comfort. As for the rest, they get to enjoy the smells, the extra warmth of the oven and, of course, the goodies. *Music - Our personal taste in music varies around here but I can always count on my friends Brandi Carlisle, Jack Johnson or The Avett Brothers to bring the perfect vibe into the house. I'm betting they all know about hygge. *Vintage and homemade items - Yes, this is really hygge. The special pieces that we create and collect tell a story. Just passing by a table we made with our family or an old quilt you collected on a trip with your friends reminds us of those special times and ties every day. My son sleeps in a bed at night that his dad and I built together for him. That's about as hyggeligt as you can get. *Books - Reading has always been an important part of my life and our home is filled with books. Aside from the 'book room' there are stacks here and there piled on dressers and end tables. Taking a book break, no matter the topic, is a great way to bring extra hygge into your day. *Nature's decor - I try to keep fresh flowers around most of the time. I'm terrible with plants but I've had good luck recently with succulents. Hey, I accept my brownish thumb and I'm proud to have found a plant variety that isn't practically D.O.A. under my care. Go with what works. I have some deer antlers and birch logs I use for decoration on my hearth. The idea, I think, is bringing the outside in when it's too dang cold to actually be outside. Today, Punxsutawney Phil saw his shadow predicting six more weeks of winter. Dig out some old treasures that evoke a special memory or feeling. Build a fire and bake some cookies. Treat yourself and your family well. Feather your nest. We could all use a little extra hygge right now. Until next time, be well, my homies. I don't love the word 'client' all that much. The people that I work with quickly become my friends and our collaborations are a team effort. I feel like my job is to help guide them through their project. I'm as hands on or off as they want or need me to be. Some people have a vision for their space but aren't sure how to get there. Others only know how they want it to feel and give me free rein to bring the feeling to life. I've been working with a friend on and off for many years, and we most recently collaborated on a dining room makeover and adjoining living room 'fluff up'. The meaning of 'fluff up' is just an edit, nothing drastic. We moved a few things around, got rid of a couple more, borrowed a chair from another room and bought some new pillows. The dining room was a bigger project. I wish I had taken a good 'before' shot. The furniture was very formal and didn't quite match the vibe of the rest of the house. They already had a paint color they loved on half of the wall so we continued that on the other half. The existing chandelier was perfect for the space, so that stayed as well. The next step was finding fabric, one of my favorite parts. We loved this print for the drapes because it had a vintage look and the tiny check was the perfect durable compliment to cover the chairs. We found both of these at The Second Yard at Hilltop. We've had lots of good luck there over the years. They found these great chairs at a local antique place and got a sweet deal on them. They are all a little different and had already been painted with the cream distressed finish. The previous owners had also painted the seat covers with (I'm guessing here) fabric paint. Don't do that. My friends recovered them in the new fabric and TA-DA! They look so perfect and add a great touch to the space. This fantastic table was custom made my Mr. My Friend. How very special for this sweet family to sit down and enjoy a meal from a table made by their daddy/hubs. You can't hide talent, although I've made this poor man wish he had hidden his from me many times. My idea for that far wall was a collection of mirrors. They already had one or two and picked up a couple more at a vintage market. They also found the ironing board at the market and decided to use it as their serving area in the room. On the opposite wall, not shown, is a large armoire that the couple purchased early in their marriage. It holds sentimental value and has huge storage capacity making it a winner all around. You can ALWAYS find a place for those pieces that you love so much, even if it means using them in a totally new way. The measure of a successful job for me is written on the faces of the families I work for. We were able to bring a more casual feel to this room with a mix of old and new, repurposed and redone. My people are happy and we are on to the next room in this cozy, happy house. Watch for that. Until next time, keep it homey, my homies. If 2016 were a person, he might go down in history as one of the most hated people of all time. Never have so many memes, posts and e-cards been dedicated to our collective disdain for a calendar year. I have personally lost someone very dear to me this year and watched so many others suffer a similar tragedy. I’ve seen many couples I care about part ways. The political climate and the separation it has caused among families and friends has been a tragedy of its own. The Orlando shootings, France, Brussels, Zika, Hurricane Matthew, the fires in the Great Smokey Mountains, Aleppo... I’ll stop there, but you get the drift. It hasn’t been pretty, but there have been so many shiny spots this year as well. I clumsily officiated the wedding of two people I adore. I found my dream camper, Clementine. I had the opportunity to travel and be peacefully still with my family. We welcomed our perfect new puppy, Hazel, into our home. Last but certainly not least, I read a fantastic book that changed how I look at myself. It helped me find the courage to start Your Home Girl. We all stood with Standing Rock, Ebola was eradicated, The Cubs did sports things that made a lot of people really happy, the dang ol’ ice bucket challenge led to the discovery of the gene responsible for ALS, suicide rates are down along with child mortality and Harriet Tubman is going to be on the $20 bill! As we look ahead a few days to January 1st, 2017, the 45th anniversary of my birth, as it happens (every year, thankfully) let us each claim our next trip around the sun as an amazing one. Find what makes you YOU - what makes you happy - and do that thing! Let us wake up every day determined to be a better version of ourselves than the day before. In order to be better, we need to ask ourselves the hard questions. Am I doing my best? What is my part in the conflict in my life? Am I giving my family and friends the best version of myself? What makes me whole? What’s fun to me? What the hell will I make for dinner? Let us close our mouths and open our ears and hearts. Let’s be curios, adventurous, generous, confident, honest, especially with ourselves, and kind. Above all, let’s be kind. Remember, we rise by lifting others. Cheers to you and to 2017. Watch for love. It’s out there. This post is dedicated to my friend, Jamie Perez. She was there pushing me along when I was trying to get up the courage to start this blog and all that goes with it. More recently, she sent me a message asking if I had seen this crazy Pyrex posting on Craigslist. I had not and I was SUPER thankful for her valuable tip. It led to this adventure. The day I got the message from Jamie, I tried to contact the seller, we'll call him "Skip". He did not answer, so I left a message. His ad clearly stated that he would NOT respond to any text messages. When I didn't hear from him, I tried sending an email to the default 'reply' account, but that wasn't answered either. I lined up my trusty sidekick/adventure buddy/designer of this site, we'll call her Grace because that's her name, with optimism. I just KNEW we would hear back from "Skip" and we were going to hit the proverbial Pyrex mother load! Wednesday morning we set out without ever even speaking to "Skip". Here it should be noted that the ad originated in Gloucester, VA, about 70 miles away from me. We both called several times and left messages but still no "Skip". I do this thing where I proclaim the reality I want for myself which sounds a little hocus pocus, I know, but it seriously works. (If you've not read "You are a Badass - How to Stop Doubting Your Greatness and Start Living an Awesome Life" by Jen Sincero, stop reading this blog and go read that.) I kept telling Grace that he was going to be calling VERY soon and so, of course, it made total sense that we were traveling to a man's house, location unknown, and whom we had never met or even spoken to. We used our time and trip to scout tons of awesome junk store locations along the way. We found some killer places and scored some great finds. When we were checking out one of these places my phone rang. You know it was "Skip", right? It was! I told him we were really near by and he told me his life story including his address and what kind of car he drove. WE WERE IN!! We drove the short distance to "Skip's" place which was right off of the main highway. It was a really small and pretty sketchy looking trailer park. Grace and I are both huge fans of the trailers as we are both owners of tiny ones so we were not at all put off by the scene. We easily found "Skip's" trailer by the description of his car, a gold Lincoln with the faux leather top peeling off. He greeted us on the porch and invited us inside while warning us not to "mind his smoking". What he meant by this was that he would be chain smoking a half-pack in the 15 minutes we were there. The inside of "Skip's" single-wide was a Pyrex Mecca of sorts. He had TONS! There were large folding tables set up in his living room and kitchen, leaving limited space for any other furnishings. He had his recliner and TV but little else. He explained to us that he didn't have a computer, that someone else had helped him post the ad. Someone who undoubtedly would not want to deal with his collection...down the road. What he DID have was a thick Pyrex catalog listing most of everything they had ever made (#1 on my Christmas wish list). This was how he was gauging his astronomical prices. It would have taken hours to go through all that he had and would have become something of a health risk for us. I got in the floor and made a pile of the pieces I was sure I couldn't live without. The very first piece he gave me a price on was a small pink casserole with lid. He began to explain how "rare and perfect" this was and that he would need to charge me $50 for it. I began to explain to him how I have a family and it's Christmastime and that I would NEVER waste that much money on a piece of Pyrex. The pink would have to stay. Each subsequent item was assigned an equally insane price based on "Skip's" perception of its value. Here is why I say "perception". He wanted to charge me prices like one would see in a very busy, very high-end antique shop. I was looking for the trailer park deal. We ended up settling on a price that I was comfortable with for everything in my pile, including the pink casserole. I hope that "Skip" learned something from my visit. I know I sure did. Here are some of my Internet ad shopping tips. *If it's too good to be true, it probably is. *Be sure to actually speak to the seller. *Never pay fancy store prices for something you are buying off of someone's floor. *Try all of the new apps - I've used LetGo recently and I like it. All communication is done through the app so no personal information is exchanged until there's an actual purchase. There are lots out there but I don't want to recommend any I've not tried myself. *Always ALWAYS bring a buddy. I like to believe the world is full of good people so why not double the fun?!?! *Never EVER pay with a Money Gram or whatever those things are called at Walgreens. It says right on the red phone where you send the money "NEVER SEND MONEY TO PEOPLE YOU DON'T KNOW". I read that when I was sending money to someone I didn't know. SCAM! Thanks for taking the time to read this post. I hope you found some useful information or at least got a giggle from our mis-adventures. Life's is short. Get out there and look for your fun! We started building our house in 1993. I was 21. 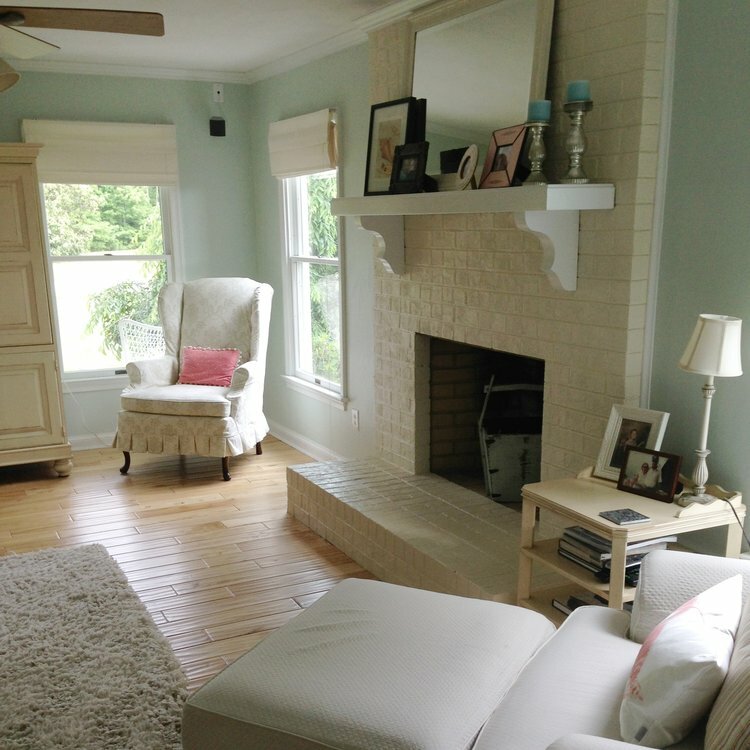 We installed all wood trim throughout the entire house and a huge brick fire place in our living room. It's just a solid, old fashion, real wood burning fire place. It dominated the room and It was dark. It was all dark. For many years, it felt right, like part of the family. It has watched over many treasured moments of our lives. As my style evolved and trends changed, the voices in my head began to whisper "paint it". I tried to ignore them at first but they grew louder and louder until one day I said to Greg, "I'm thinking of painting the bricks." He basically told me in so many words that we wouldn't be doing that. His vehement belief in the raw brick loomed large for quite some time...like way too long. One day he came home and I had painted the brick fireplace. He LOVED it painted and asked "Why had I not done that sooner??" The moral of this story is sometimes it is better to ask for forgiveness than permission. These are the best 'before' pictures I could find. Surely better ones exist, but I will lose the entire day in old pictures if I'm not careful. (Sorting my photos is on the long long list.) Here we see my precious girls posing on Valentine's Day. The big one is stealing the show with that face. I'll share with you the steps and materials used in case you too have voices that need taming. Step 1 - If there's an outdated door, screen, insert or surround, ditch it. FAST! Step 2 - Use a stiff brush to 'clean' the bricks. Just give them a good firm brushing and then go over them again with the vacuum. Step 3 - Prime it...really well. Get in every nook and cranny. This is my favorite primer. I use it for most everything. Step 4 - Paint it. At least two coats. There's a time for excellent paint and this is it. I use Sherwin Williams Pro Classic for jobs like this. You can have it tinted to any color you'd like and it is 'self healing' meaning it doesn't show your brush marks. In addition, it's SUPER durable. It has really stood up to the test of time on this and many other projects. Step 5 - Impress your people with your amazing skills. *Note: If you have a wood mantle like us, you can use the exact same materials to paint it as well. Thanks for checking us out this week. Stop back by soon and don't forget to subscribe on the home page for updates and new posts. My goal for Christmas this year is to shop as local, green and fun as possible. If we each spent $100 more at local businesses instead of chain stores, it would put an extra $3 million a year into our local economy. When you shop local, you are supporting someone's dream! How amazing is that?!?! Plus, there's nothing like the thrill of finding that perfect something for the folks you love. I've compiled a list of some of my favorite places to shop and a couple of events I'll be checking out. Hop off of that beaten path and let's make a difference! I'll start right here in my own backyard. Our tiny spot on this planet has two really killer places to check out in beautiful Downtown Pungo. Pungo Board House, aka PBH, located at 1789 Princess Anne Rd. - Virginia Beach, is loaded with nifty goods from, as clearly stated, BOARDS of any kind (see what they did there!?) to cozy hoodies and lots in between. As an added bonus, it always smells like summer in this rad shop. Conveniently located next door to the Board House is The Tar Roof. This place doesn't fit any mold to me. There is a ton of amazing art, hand made pottery and jewelry. Right next to that, you might find some of the most delicious peanut butter you've ever tasted. In addition, they are an events venue and they offer fun make-and-take art classes. Seriously, just go there. Not terribly far from Pungo is 3 Little Black Birds located in the heart of Great Bridge at 217 S. Battlefield Blvd. - Chesapeake. It just looks like a cool old house when you pull up, but there is so much more to this place than meets the eye. It's FULL of treasures and just seems to go on and on. A little tip for you: the treats on the table in the front room are for puppies. You can guess how I know that. There are some other cool places in Great Bridge, but I know a few have closed or are about to. If you're over that way, just keep your eyes peeled for these other stops. From Great Bridge, you can hop on the bypass and head out to Norfolk. One of my favorite spots is Mrs. Pinkadot. Even before my first visit, I just really loved the name. They are loaded with more great stuff than you can shake a stick at. Everything is super tidy and really well displayed. Right next door is Attic Treasures. Again, chock-full of fun. Be prepared to spend some time in these two places. Just to the right of Mrs. Pinkadot is Urban Castaways. This shop is beautiful and has a selection of some higher-end finds. Definitely worth a stop in. Now we move on to the Colley Ave. area. Kitsch is located at 807 Shirley Ave. - Norfolk and is loaded with fun, funky handmade goods with a sprinkle of vintage thrown in. This is a smallish shop but it's for sure one of those "size doesn't matter" scenarios. This place has more fun per square inch than a slinky! Bridget's is just down the block at 1911 Colley Ave. - Norfolk. This bright and wonderful shop has a different but equally stunning selection of unique gifts. Your problem will be leaving behind the "one for me" items you may discover you can't go on living without. If you were lucky enough to catch the fall Crafted VA at O'Conners a few weeks ago, then you know you should not miss the holiday pop up they're hosting this Saturday, November 26th, at West Elm. My dad would say, "You can bet your sweet bippy I'll be there!" I've never been to this event. Heck, I don't even know if they've ever even had it before, but I need to find out what it's all about, so again, I'll be there with sleigh bells on. It will be held on Saturday, December 10th at The Plot - 776 Granby St. - Norfolk from noon until 5pm. If you have something super specific in mind or if you just want to see what else is out there in the wonderful world of vintage, hand made or uniquely inappropriate, visit Etsy. If you've not yet heard of this miracle website, you are most welcome. There are so many vendors here that are crafting custom made fun, it truly boggles the mind. Lastly, I'll say a few world about thrift shopping. I'm a huge fan and we have some great locations around Hampton Roads, VA. My two best tips are shop on Tuesday and with zero expectations. I know there are so many other great places out there, but these are just a few of my personal favorites. Drop me a note or add a comment if you think of something imperative that I've missed. I'm not crazy and I have kids too, so I know there will be things we must buy elsewhere, but at least try this. Flip the product over and check for the "Made In USA" label. I'm wishing you all a blessed Thanksgiving and the most pink Black Friday ever! Raising my babies is where I have invested my life and love for the past 21 years. I know, I know, I don't look a day over 21 myself but I promise, It's true. I'd be lying if I said I wouldn't change a moment of it because as all parents know, raising humans certainly has its challenges. An example of something I might change is the keeping and caring of their bedrooms. When they were littles, their rooms were decorated so adorably and I kept them tidy all of the time. We went through many decor changes over the years. We had the secret garden bedroom, the mermaid bedroom, the baby farm bedroom, the tween boy bedroom (that's the one where everything is kind of gray and red because you don't really know how to make it cute), the mod bedroom, the lavender and mint green toile fancy bedroom and three sweet nurseries. There were others, but these are the ones that jump out at me. The 'kid" rooms of today are adaptations of some base style that has morphed into each of their own personal style. My baby girl, sweet Amy, is brilliant, kind, beautiful and quite untidy. They actually all are, but I'm picking on this baby today because her room is where an amazing transformation took place. Her floor. The 'before' was worn and stained carpet. She and I both wanted the 'after' to be something different and special. We came up with a plan using 4 X 8 sheets of 3/4 inch cabinet grade plywood. We set up our table saw and ripped planks that were all 8 inches wide. We came up with that number because I wanted them to be wide and that left the least amount of wasted drop. (Drop is a word I learned from the hubs used to describe the leftover wood that's too tiny to be useful.) We said 'goodbye' to the old carpet and started laying our planks. We were strategic in placing the planks in a staggered pattern. Greg made a template that we used to mark the boards at the spots where the screws should go so that they were uniform throughout the room. This is Leah, our niece and next door neighbor, helping out. She's going to make an excellent supervisor one day. 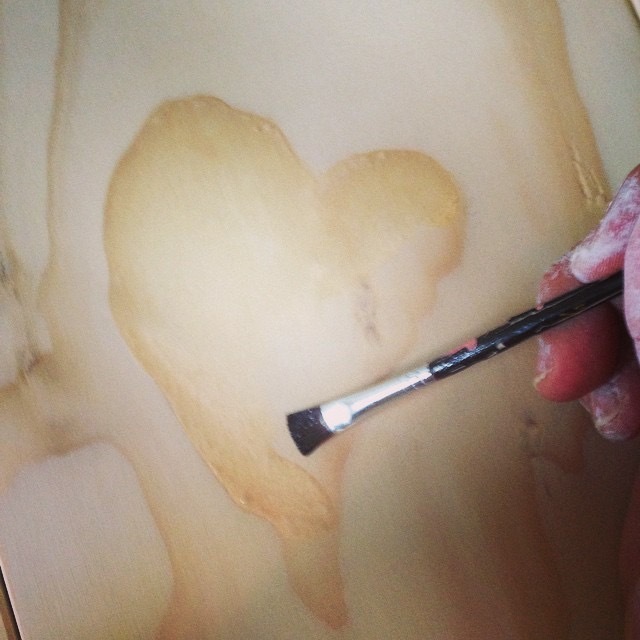 I noticed early on that there was a heart in the grain of one of the planks. We saved it and used it in a place where it was pretty prominent. I gave it three coats of poly before I put the finish on the floor to retain the original raw wood color. It's the little touches that make projects like this personal. It's positioned right by the door so my Amy sees it each time she passes through the threshold of her room. There are no photos of the next step which was caulking every. single. joint. This step wasn't part of the original plan but some of the joints were larger than others and that was hurting my brain. It was hard on the knees and back and took a looooong time BUT the finished look make it totally worth it. Behind all of the caulking was the white washing. I mixed white paint with water, I'd say close to a 50/50 ratio. It was thin and required two coats. The raw wood really soaked up the wash. I brushed it on and wiped it off and it was seriously messy. The last step was two coats of polyurethane. I used the matte finish on this project. It came out beautiful and it feels so good underfoot. Our place has lots of different kinds of flooring and much of it needs replacing but this is my favorite in the whole house by far. Thanks for visiting. We are working all the time to make our blog and website more user friendly and interactive. If you have questions about this project or really anything, drop us and email. Y'all come back now. For the past 15 years or so we have used this space as the "school closet". We kept all of our school tools, backpacks and important papers in there along with our craft supplies for projects and such. If you look closely you can see the kids' name labels over the hooks. It was organized and super useful for many years but it wasn't at all cute. The shelves had 23 year old contact paper on top of the stained wood. Removing that and sanding the shelves was by far the most un-fun step of this makeover. Once I pushed through that and moved on to the priming and painting of the shelves, the rest was cake. All of the wood trim and shelf bases required the same priming and painting treatment as the shelves. I moved on to the walls after that, painting most of the walls and ceiling white. You can see the big difference between a raw plaster white and the white paint. **If your walls have never been painted and your place feels dull, just a coat of white paint can make a huge impact. I decided it would be fun to paint one wall the same green as my kitchen. I was really glad I did because in the end it made the space feel more cozy. The strange little door in the wall was added several years after we built the house. It was put there as an access for this big central dust control unit we had installed to help my kids with their allergies. It never really worked. In a brief moment of brilliance I came up with an idea for making the most of that bizarre, unused space...stay tuned. For extra personality I wanted to add some wallpaper. I haven't used wallpaper in a long time and I was going for cheap and easy so I went with the peel and stick Contact paper. I really liked this pattern and I figured if I get sick of it I can just take it down and change it. The removing and replacing of the light was a bigger deal than I had anticipated. The frame for the (hideous) fluorescent light was mounted directly to the ceiling in such a way that removing it left huge holes behind and gave us no box to connect the new fixture to. This meant I had to call in reinforcement. My hubs reminds me (in a really unpleasant voice) every time I need electrical help that he "IS NOT A FREAKING ELECTRICIAN" but he solved the problem, I patched the holes and the result of our joint effort looks amazing. I made the secret hidey-hole into a spot for liquor storage. 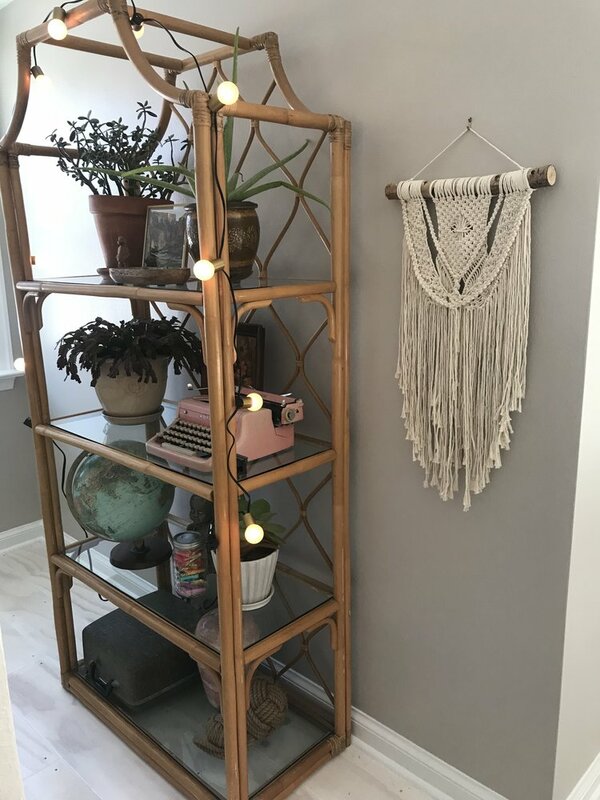 I found an outlet in there so I grabbed a little lamp from the attic, a funky wine rack from a junk store and a rug from the clearance endcap at Target. I hung a sign I made on the door that reads "In compliance with the 18th Amendment NO intoxicating liquor allowed on the premises". It's our own little speakeasy of sorts. Here's the finished project. My inspiration from the start was that I badly needed a place to store and display my Pyrex and my other fun vintage kitchen gadgets. If photography were my thing, it would make appreciating how this turned out much easier but I couldn't love it more. I'm on the hunt for a vintage door with plenty of glass so that I can stand in front of this pantry and weep over the beauty within. Here's the thing, all of your spaces should feel great to you. If you have a cabinet, closet or drawer that can change your mood when you open it, do something about it! Clean it out, paint it, organize it or call me and I'll make it better for you! I've spent my morning running around to my favorite paint spots gathering the best cream colors available to us, the regular DIY type folk. One would think that this would be an easy task, finding the perfect cream, but thats not so. First of all, nothing is perfect (except my puppy) (who on second thought pinned my friends mom against the garage the other day so never mind on that one too). Creams can easily fall towards the yellow, pinkish or the muddy grey/brown/green/ side so choose carefully. I have nothing against those colors but if you're going for a true cream you might like some of these options. These three are from Lowes. They are all great creams so how would you ultimately choose? Here's how I do it. I pick my favorite name. That's right, I can't bring myself to use a paint that has a horrible name, regardless of the actual color. The paint naming people should take the 'name snobs' like me under consideration when they are choosing the names for the paint colors. They would have so many less sample chips of "Minstrel Heart" and "Butte Rock" left over. These samples are all from Sherwin Williams. My favorite here is Créme, again based on the name. I love the paint quality at SW but unless you can catch it on sale, it's pretty pricey. A little paint hack is to have another paint counter mix your color choice for a lower price. I believe they all have access to each other's color codes in their computers. Thank you so much for stopping by and checking out my blog. I hope you didn't find this post too vanilla. Today's post is dedicated to my friend, Kristin H. who asked about my favorite creams these days. For many years my go-to color was called "Cozy Cottage". I've used it and recommended it over and over again but they have discontinued the color at Home Depot. If you have a question you'd like to ask or a project you need a quick opinion on, please send me a note! I'd love to help out if I can. Who Loves Ugly Old Dressers? MEEEEE!! My mom was cleaning out her storage shed and gifted me with this super ugly dresser. It just so happened that it was the perfect size for a space in my foyer I was working on. I loaded it up and brought it home for some tlc. I'm a sucker for a stray. 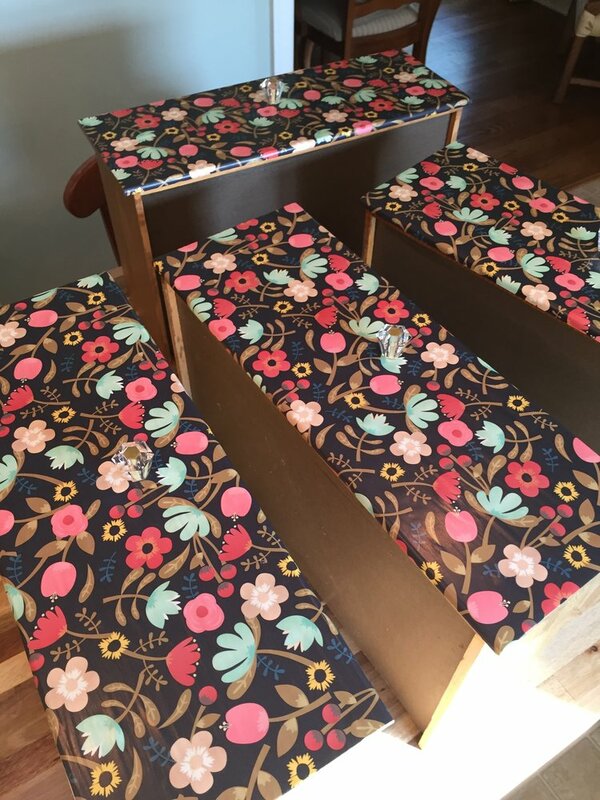 Next I spray painted the drawers a fancy gold outside and inside so that when the drawers are opened you can see some extra pretty. Reminder: this thing needed all the help it could get. The next step was the drawer fronts. I had been hanging on to this beautiful wrapping paper for a couple of months. I picked it up in the checkout line at T J Maxx (favorite) so it was inexpensive but really heavy, nice quality paper. I cut the paper to size and used Mod Podge on the back of the paper and the fronts of the drawers. There's a small window there where you can move things around a little to get the best fit possible. I let them dry overnight and then applied a top coat of Mod Podge the next day, again allowing it to dry over night. It's the tiny touches that make the biggest impact on projects like these. 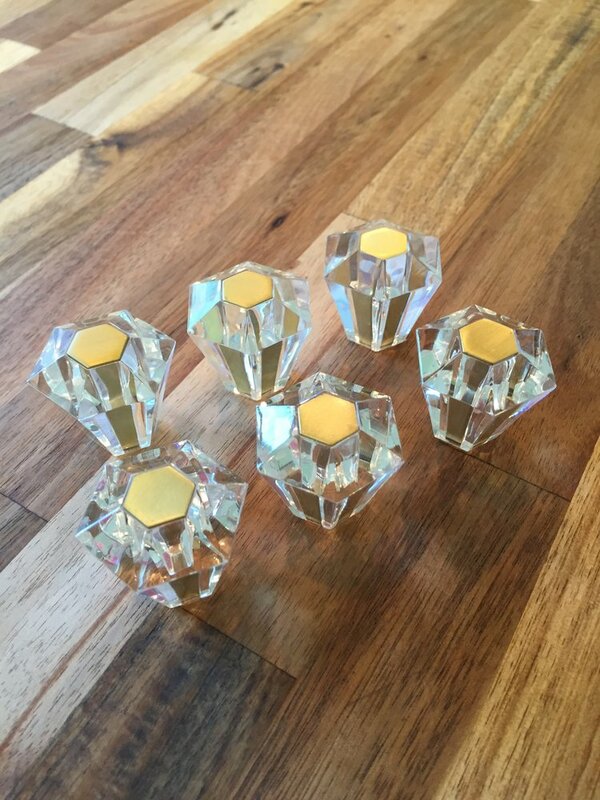 I found these perfect little knobs at Target. They went great with the gold in the paper and were also my inspiration to paint the drawers gold. My Home Depot (I say 'my' because I go so often. I'm expecting to be selected as employee of the month any time now) has a fantastic paint department. My friends there, just as an experiment, tried to color match the background of the wrapping paper in a sample size. It was a perfect match and just the right amount. 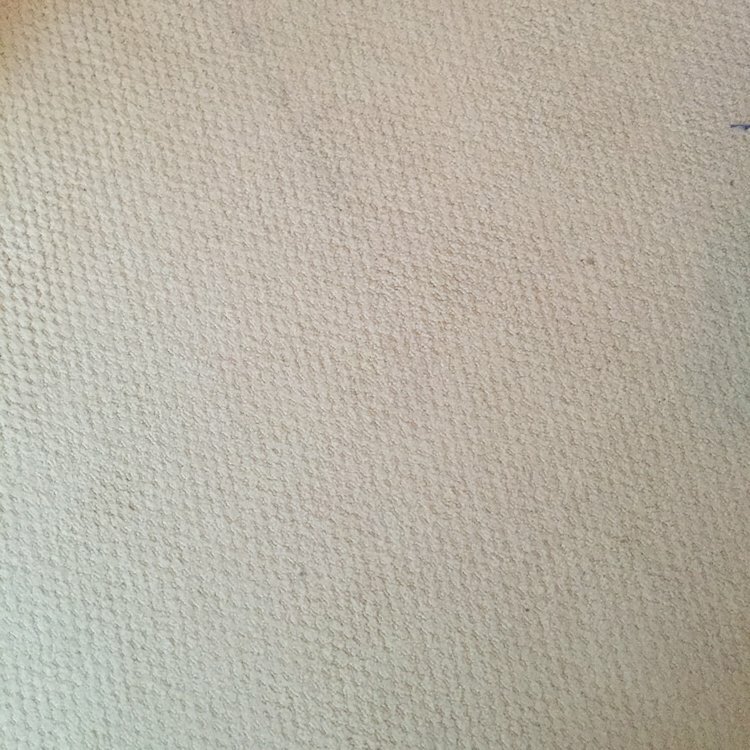 I was only painting the frame. I mixed the tiny jar of paint with some chalk paint powder that I saw reviewed online. This stuff was pretty magical. It's called BB Frosch Chalk Paint Powder. In all of my DIY adventures, I had never experimented with the chalk paint. It went on really easy and covered so well. I know there are lots of steps one can take in the chalk paint world but I was fine with trying step 1 for my first time out. It did feel "chalky" after it dried so I gave the entire frame a finish coat of Mod Podge. I know all of this Mod Podge use may sound a little '90's crafty' but I tend to use what I have around. Thank you for visiting my brand new site! I hope you will stop by again. Please feel free to contact me if you have any specific questions about this project or just want to say "Hey!"